The beautiful undulating land that Rancho Santa Fe now rests upon originally held local Kumeyaay Indian communities. Although, within the last two centuries it was under the jurisdiction of three successive governments, Spain, Mexico, and the United States of America. During the Spanish colonial period, Rancho San Dieguito was given ‘pueblo’ status by Spain because of the population of its native peoples. After Spain enacted the 1830 Act of Secularization the Mexican Republic era came to power, albeit for just a few decades before California statehood in 1850. In 1831 Librado Silvas obtained a portion of Rancho San Dieguito under a provisional grant issued by Mexican Governor Manual Victoria. After Victoria’s overthrow, Juan Maria Osuna received permission from Governor Jose M. Echeandia to occupy the land and he took possession of it in 1836 for a future family home and ranch. Osuna was born in 1785 and raised at El Presidio Reál de San Diego. His father was a corporal in the Soldados de Cuera (Leather Jacket Company), who escorted Father Serra and his entourage into Alta California at the onset of the Spanish Colonial period. Osuna worked his way up the military ranks and in 1834 the Mexican period San Diego held its first election. Juan Osuna was elected Alcalde or mayor. Osuna was the first military man to leave the Presidio and began ranching. He chose the property he had trekked across many times as a soldier between Mission D’Alcala and Mission San Luis Rey. In 1840 or 1841, Governor Juan B. Alvarado gave him a provisional land grant, and finally, in 1845 Governor Pio Pico awarded him full title to the two square leagues of land (8,8224.71 acres) that comprised the entire Rancho San Dieguito. While Osuna preferred to live in San Diego he built an adobe ranch house at Rancho San Dieguito for himself and his wife Juliana, known today as Osuna 2, (privately owned). He left the duties of managing the ranch to his son Leandro, to whom he gave the existing Silvas adobe, commonly referred to as Osuna 1. Although a fine Alcalde Osuna was also a gambling man, and lost some of his land to pay off bad debts. Upon his father’s death in 1851, Leandro took possession of the land. A veteran of the Battle of San Pasqual in 1846, Leandro was a man of erratic temperament. His cruel treatment of the Indians led to his demise in 1859. Tiring of this harsh treatment, it was rumored the Indians poisoned Leandro and then told him of his impending agony. Rather than face a slow, painful death, he committed suicide, leaving the care of Rancho San Dieguito entirely in the hands of his mother, Juliana, Juan Osuna’s widow. By 1875, only a small portion of the land remained in the possession of the Osuna family. The last parcel under their ownership, 116 acres, was sold in 1906. In 1906 the Santa Fe Railway, a subsidiary of the Atchison, Topeka & the Santa Fe, purchased all of the lands that made up the original San Dieguito land grant from several owners, including the Osunas. The railway’s intent was to use the land to grow lumber for railroad ties. 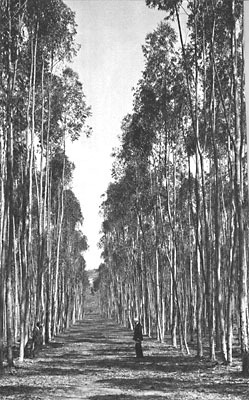 From 1906 to 1914, after much study and experiment, Walter E. Hodges, vice president of Santa Fe’s California properties, planted 3.5 million Eucalyptus trees from seed on 3,000 acres in the southeast section of the land grant closest to the San Dieguito River. Overtime, the venture proved unsuccessful, predominantly because despite the species phenomenal rate of growth the trees had to be quite mature, even old-growth, to have the structural capacity needed to underlay the rails for the great trains coming West. Santa Fe was ready to walk away from their well-intended failure. Just weeks before they were to put the land grant on the market one of San Diego’s most significant land and water developers, Colonel Ed Fletcher, intervened and assured them they could change course and recoup their losses. Both Fletcher and the Santa Fe were fully aware of the agricultural potential of the property. In today’s horticultural parlance, San Diego County is known as the ‘Avocado Belt’, prime land for agriculture, horticulture, and most famously, floriculture. Fletcher convinced them that if they planted the land in citrus and avocados they could make money off the ‘tonnage’, or shipping, of California fruit back East. The brilliant idea of ‘Gentlemen’s Farmer’ estates arose and from then on a new project was launched. It was obvious in order to support the numbers of orchards that were envisioned a dependable source of water would be needed. Again, Fletcher comes to the rescue with upstream landowner William Henshaw who held the riparian rights for the San Dieguito River. Soon Walter E. Hodges, on behalf of the Santa Fe Land Improvement Company, laid the groundwork for the construction of what would later be called Lake Hodges Dam. The Santa Fe Irrigation District was also formed and provided water for not only Rancho Santa Fe but for the downstream communities of Del Mar and Solana Beach, which coincidentally were being developed by Col. Fletcher. By 1921 Santa Fe filed a subdivision map generated by land expert and road engineer Leon Sinnard. It outlined land parcels that radiated out from a central core of small lots to very large ones. A Civic Center now referred as the ‘Village’ was comprised of the Santa Fe Land Improvement Company’s offices and Francisco’s food market, a Garage Block, a schoolhouse, village rowhouses for Santa Fe staff, and a Guest House, later named La Morada, now the Inn at Rancho Santa Fe. Later more commercial buildings were added. At the time of the filing of the map, Santa Fe decided to retire the name of Rancho San Dieguito for their namesake, Rancho Santa Fe. Thus, began the planning and the construction of homes, estates, orchards and roads that traced the natural topography. Staying in character, the Santa Fe hired the best architects, Requa Jackson and Lilian J. Rice; landscape architect Glenn Moore; and agronomist A. R. Sprague, among others. Soon a stunning semi-rural community sprang from the land. Born out of its inherited traditions, yet for modern living, and steeped in art and character. In 1928 the Rancho Santa Fe Covenant was recorded, which formed the Rancho Santa Fe Association and Art Jury, which was meant to ensure the orderly development and retention of the ranch’s character after the Santa Fe planned their exit.